These are your sink mounting options for granite. 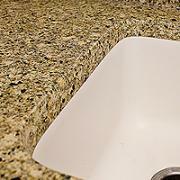 Because of maintenance issues, we do not recommend integrated sinks with granite countertops. Talk to a designer for more details. This is the traditional style, where the sink is mounted from the top of the countertop into the sink hole. Top-mount sinks are the most economical choice. 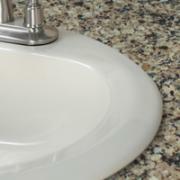 Undermount sinks are by far the most popular choice in granite countertops. This sink style is very clean looking and easy to maintain. It mounts under the countertop, making clean up a breeze!